Expand on your knowledge of macramé and take your process to the next level. We will explore macra-weave techniques, working with color, macramé as sculpture, and utilizing different sizes and weights of rope, yarn and other non conventional materials. Get inspired by the scenery of the Washington Coast and design a piece that takes you out of your comfort zone. The workshop will begin with a circle and intention setting, followed by drawing out our ideas for our projects. If participants want to make a project from our book, Emily will guide you to get started. We will pause for a healthy lunch, and continue working on our pieces into the afternoon. 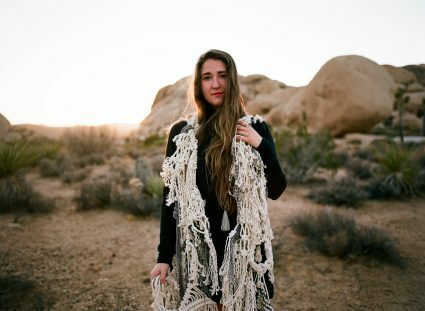 Emily Katz is an artist, world traveler, teacher, interior designer, creative consultant, public speaker, and the owner of Modern Macramé. 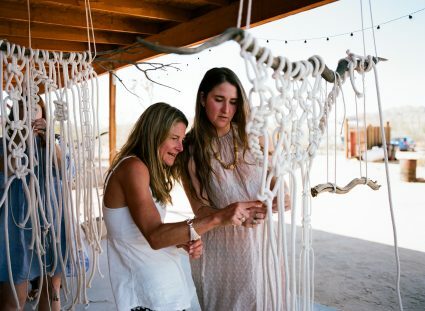 Emily has taught macramé to thousands worldwide through private lessons and team building workshops, from LA to Tokyo to Copenhagen. Her creativity doesn’t stop there, as she has designed restaurant interiors and residences inspired by her travels, as well as large-scale custom macramé installations for clients like Ralph Lauren, Microsoft, and Nordstrom. Named as the “Queen of Macramé” by The Guardian UK, her work has also been featured in LA Times, Elle Japan, Buzzfeed, and more. As a self-made entrepreneur of 15 years, Emily employs an all-women team of creatives at her studio, which serves as a production center, showroom, office, and event space. The author of the best selling book, Modern Macramé, Emily loves to explore design and macramé together. Emily calls Portland, Oregon her home with her partner Adam and their dog Donut and cat Cowbear. BRING: This workshop expands on what you know, so feel free to bring a project in process that needs some inspiration, or get started on a big piece. Bring any special materials you want to work with including driftwood or any other support to build onto. (There will also be rope and yarn for sale on site.) Consider choosing a project from our book to explore! We will also have time to draw a design of what you have in mind to create. This workshop is for students who already know the basic square knot and is for students age 10 and up. 15 students max. This class is part of the Spring/Summer 2019 Workshop Series. All classes are open to the public and all skill levels welcome. Visit www.souwesterlodge.com/art/workshops to see the full schedule of artist-led workshops.